Jeep drivers have a wide variety of personal tastes. Some of them have a preference for the good ol' days, looking at the past with a wistful eye. Jeep has a long history of production, and this T-shirt is a tribute to those beginnings. 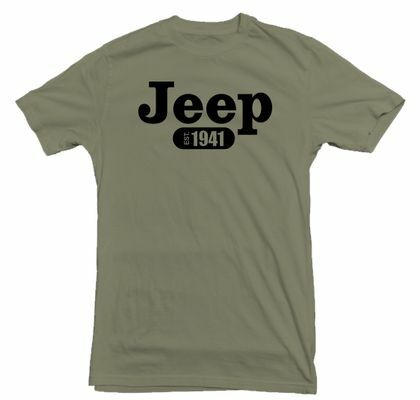 This Jeep shirt features a retro logo printed in black on a military green T-shirt, as a tribute to the first Willys MB Jeeps that rolled off the line in 1941 for the U.S. Armed Forces. While this shirt salutes the past, it is loaded with all the comfort and durability of a modern shirt. Crafted with a classic fit, it is made from pre-shrunk 100 percent cotton and is fully double-needle stitched. That means each shirt will feel soft and comfortable right out of the box, before the first wash. The Jeep 1941 Military Green T-shirt is one of many that we offer at Just for Jeeps. Its construction and classic design make this a perfect fit for Jeep drivers who are history buffs or supporters of the military. He was so thrilled, he loves it. Fits true to size. Very pleased with this t-shirt. soft and comfortable. Good price. the staff who handle customer service are outstanding. They made sure I received the shirt I ordered by Christmas even though one shipment was lost. They were helpful and pleasant. Would definitely order from Just for Jeeps again. Received complete order faster than anticipated and quality was great. Will Definetly order again. This was a gift for my husband and he has enjoyed wearing it very much.